If you analyze Nintendo's release habits, a surprising pattern emerges. 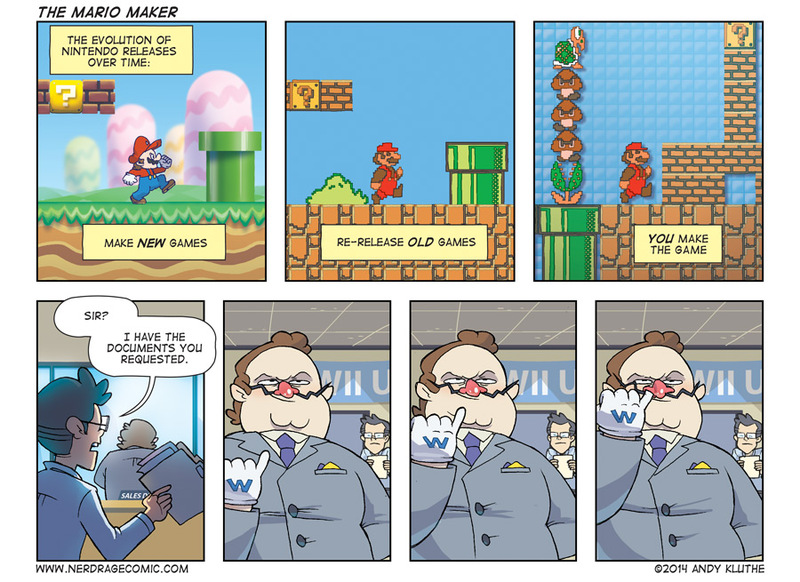 This week's comic actually came up before Mario Maker was confirmed to be a real thing. When all we had was a supposedly leaked photo my friend commented that it made sense if you looked at Nintendo's releases over the years they've gone from a focus in releasing new games, to releasing rehashes and old games, so the next obvious step would be to release a game that the player has to make themself. I responded that it was more like they were adhering more and more to a development style advocated by their Wario Ware games. Coming from someone who spent many hours in his childhood fiddling with Mario Paint and many more hours in his adult-hood fiddling with Little Big Planet, I think this new Mario Maker could be a lot of fun.